If you don’t have your own washing machine and have a smaller space, a portable washer may be your answer. There are countless products on the market today, each with a different feature set, capacity and design. Our team performed in-depth research on portable washers to help you make the best decision and keep your laundry woes at bay. For each of our selected products, we provide information about their specifications, key features and other considerations. If you’re not sure what features you need in a portable washer or what to look for, check out our buying guide below. Read more about our methodology. The Panda XPB45 Small Portable Compact Washer makes it easy to wash large batches of clothes at once. Its user-friendly design, spin dryer and simple installation ensure you’ll have clean clothes in no time. The Giantex Portable Mini Twin Tub lets you wash clothes, quickly, quietly and without hurting your pocketbook. With a powerful, yet quiet agitator, this portable washer can tackle even the toughest stains and can wash up to 11 pounds of clothes at once. Tackle even the toughest stains with this portable washer. Its touchpad controls let you navigate the machine with ease, and six cycles ensure that no matter the type of clothing you wash, this machine gets the job done well. With a 0.9-cubic foot capacity and quiet operation, you can set this washing machine and forget about it until you hear the machine signal. 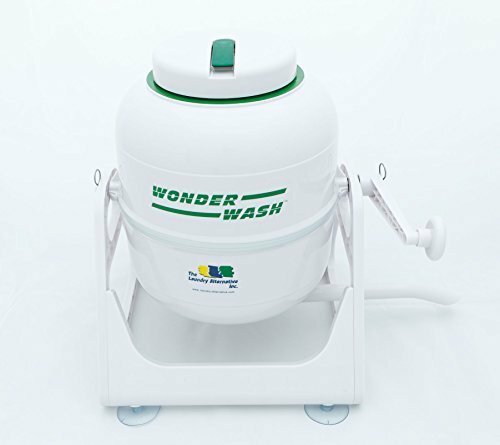 Wash several clothing items within minutes using this portable washing machine. There is no need to worry about excessive hoses and electrical plugs, which makes this device excellent for camping, motel rooms, RVs, and for users who want to go green. Spin or air dry clothing efficiently without the need of a full-size machine. With a large 2.1-cubic foot capacity, six cycles and a LED display, you have all the tools you need to wash and dry clothes quickly and hassle-free. One of the first things to consider is how large of a portable washer you actually need. A washer 1.5-cubic feet and smaller is ideal for just one individual’s load of laundry. If you have a family of two individuals or more, you should look for a larger product. However, keep in mind that a washer with a larger capacity may also boast larger dimensions. A spin dryer pulls water out of the clothing, allowing them to dry faster on a clothing rack or a laundry line. It does not completely dry items, like a full-sized dryer. Many budget-friendly items that offer a spin dryer typically boast a twin tub design, meaning that after washing the clothes, you must move them to a separate tub to dry them. Portable washers range in size from fitting on your countertop to standing 3 feet tall. Before making any purchasing decisions, check the dimensions of the product to make sure it fits in the areas you’ve allocated for the machine. Look for machines with several cycle options available. Common cycles include normal, heavy, delicate and cotton. The more cycles the product offers, the more versatility and control you have in determining how your clothes are washed. These machines can be setup in a matter of minutes or can cause large headaches. Avoid washers that require extra work to use — such as manually filling up the washer with water — or that require purchasing additional parts such as hoses or connectors. For less than $100, you can get a budget-friendly portable washer. These are typically smaller units, with only a small handful of cycles and setting options. The cheaper products may not offer any type of spin dry capabilities. For products costing between $100 to $300, you will find a quality washer that is ideal for most home use. These products typically provide the power you need to wash all types of clothing and provides plenty of cycles, water levels and a spin dryer to make laundry a breeze. 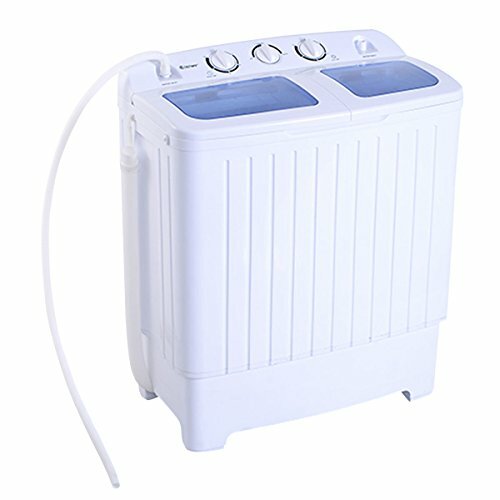 Products more than $300 are ideal if you want a hands-free portable washing machine. 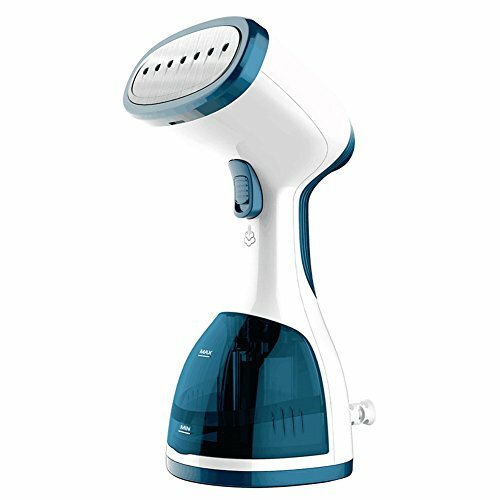 These higher models provide additional features such as air drying capabilities, delay start options and tub cleaning features that you won’t find in cheaper products. Don’t be deceived by its name as the Panda Small Compact Portable Washer offers a large capacity and is ideal for families. It boasts a durable twin-tub design that lets you wash and spin dry clothes simultaneously, cutting down your time spent on laundry. 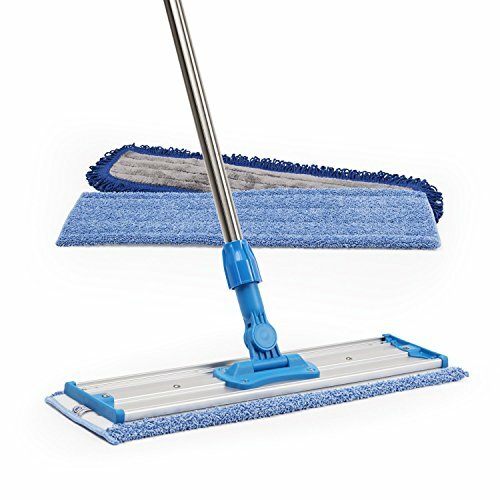 It offers plenty of power, which ensures your clothes come out clean and grime-free, but unfortunately, its power is known to twist and tangle clothing in the washing tub. 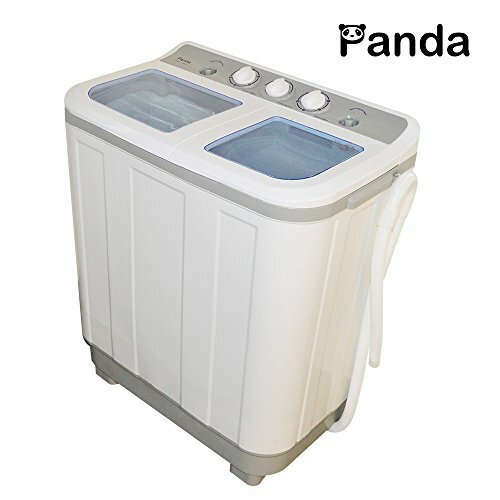 If you want a portable washer that is simple to use, powerful and can handle large loads of laundry, this Panda portable washer is one we highly recommend. Large capacity. While the machine itself is small, it is still large enough to handle sizable amounts of laundry. It can easily wash up to 12 pounds of clothing, which is ideal for two or more individuals. Simple setup and installation. While some products can be a nightmare to install, the Panda Small Compact Portable Washer takes only a few minutes. It includes all the necessary parts so you don’t have to purchase additional items and the drain hose, inlet hole and lint filter are all easily accessible on the device. Durable twin-tub design. The twin tub design allows you to wash and spin dry your clothes using the same device. This machine is made from durable plastic so you don’t have to worry about rust and other materials damaging the machine. User-friendly settings and navigation. A knob display lets you easily choose between cycles and adjust the timers for both the washer and spin dryer. Everything is labeled so it isn’t confusing and overwhelming to use. Extra work to use the spin dryer. This machine is more hands on than other products. The washing tub simply washes the clothes and you must manually move each load into the spin dryer to wring out extra water. Prone to twisting clothes. This machine is powerful and tends to twist up clothes while washing. However, you can use a mesh bag to protect your clothes and prevent so much untangling. The Giantex Portable Mini Twin Tub is an excellent pick for buyers who want a machine that’s quiet, powerful and can fit within a tight budget. This compact washer features a large feature set with two cycle options, a large capacity and a built-in timer. It is extremely compact and portable, allowing you to move it from room to room with ease and to store it without any problems. Quiet operation. You will hardly know this portable washer is running with its low sound levels. However, it is important to keep the machine balanced or the noise level will increase. Compact and portable. At only 24.8-inches long, 14-inches wide and 28.25 inches tall, this portable washer doesn’t take up much space in an apartment or condo. It only weighs 32 pounds, making it easy to move from room to room if needed. Increases productivity. Due to the twin tub design, you can run both the washer and the spin dryer at the same time. This means you can get more clothes washed at once without wasting time between cycles. Spin dryer efficient and powerful. The spin dryer can handle up to 6 pounds of clothes at once and offers enough power to remove a significant amount of water. Your clothes will air dry much faster after using this Giantex washer. Few cycle options. You don’t have much control over how clothes are washed with this portable washer. You can choose between a soft and a normal cycle — nothing more. Installation and included materials are challenging. The installation process for this portable washer is much more time-consuming than similar products. Additionally, many users had a difficult time with the included hoses and found they were too short and of low quality. 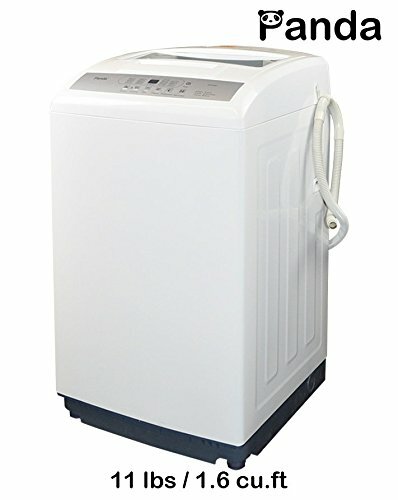 If you are doing laundry for multiple individuals, you need a large capacity portable washing machine. These machines let you wash more clothing items at once, without damaging the machine or affecting its power. With a large capacity portable washer, you can typically wash several shirts, a few pairs of pants or several towels in one load. Not only can you wash up to 11 pounds of clothing in just one load, the six cycle options let you choose exactly how your clothing is washed and treated. This portable washer boasts touchpad controls and a LED display, allowing you to navigate throughout the all the features and cycles with ease. User-friendly. 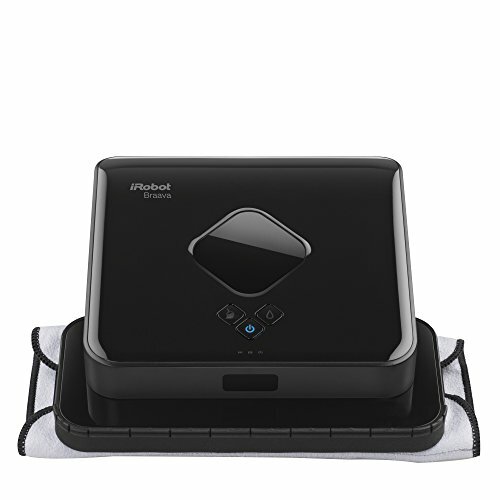 Navigate through all the features and setting options available on this machine using its touchpad control. Well-labeled touchpad buttons let you easily choose your settings and LED display lights let you know exactly what settings and features you have chosen. Six wash cycles. Easily wash all types of clothing from delicates to heavy jeans with this machine. With six cycle options, you have complete control over how the machine washes your clothes. The cycles are normal, quick, cotton, jeans, anti-wrinkle and air dry. Quiet operation. Despite the large size of this portable washer, it is quiet. Many users report they had to go and check the machine just to make sure it was still running. Durable. Even after extensive use, this machine can handle most demands that come its way. With a stainless-steel tub and durable construction, it is built to last. Makes safety a priority. A transparent lid lets you look inside the machine while running. And if the lid opens for any reason while operating, a loud beeping noise will sound. This keeps curious little fingers from touching the machine without your knowledge. Less portable than other models. The larger capacity of this machine contributes to this machine’s large size. It weighs 68 pounds, making it difficult to move around your home. However, it does feature two wheels on the bottom of the device, but many customers complain these wheels are too small to be useful. 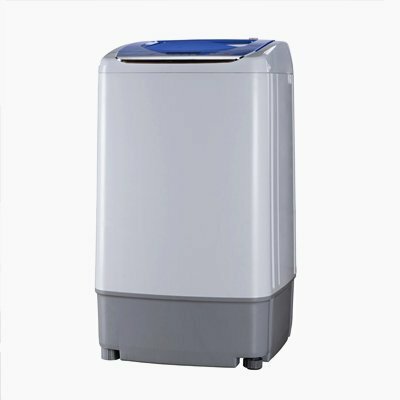 You should buy a small capacity portable washing machine if you are looking for a fast and compact option when washing clothes for yourself or your partner. 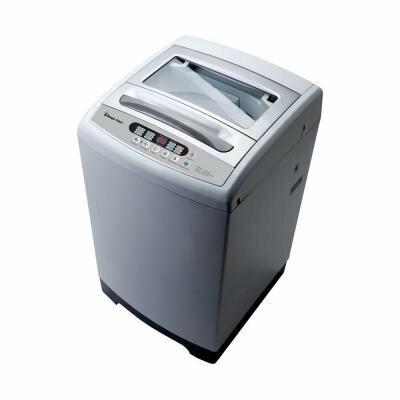 Small capacity portable washing machines typically have smaller dimensions, making them easier to store in a small apartment or condo, yet still provide many of the same features and tools you will find in larger machines. This 0.9-cubic foot machine is ideal for just one individual’s laundry. It boasts five cycles, including a spin dry cycle, and three water level settings so you have complete control over washing your clothes. 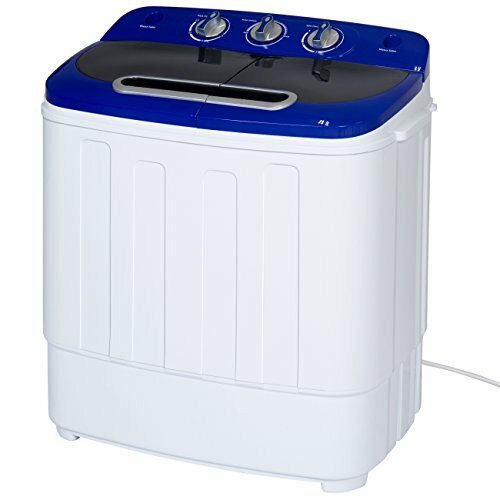 The small size of this Midea washing machine makes it easy to move from room to room and to store in a small apartment. Small, compact design. Measuring only 20-inches long and 31-inches tall, this machine takes up little space in your home. Plus, it weighs a measly 44 pounds and boasts two wheels on the bottom of the washer, allowing you to move it from room to room with ease. Five wash cycles. The variety of wash cycles — normal, jeans, cotton, quick and anti-wrinkle — make It easy to wash several clothing items. Several similar products do not offer such a wide variety of cycle options, particularly for such a small machine. Little water left in clothing. This machine comes with a powerful spin dry cycle that removes most of the water from your clothing. Additionally, to utilize the spin dry feature, you don’t have to move clothing to a special dryer, like with a twin tub design, which saves you both time and effort. Loud spin cycle. Many users praise this machine for its quiet operation. However, when using the dry spin cycle, this machine becomes increasingly louder and may disrupt close neighbors. Whether you are looking for an easy way to clean clothes while camping or trying to keep your electric bill low, a non-electric portable washer is worth considering. You don’t have to worry about electrical outlets or choosing long cycles. Instead, you use less water, it takes a small amount of time and non-electrical washers are more gentle on your clothing. Wash even the dirtiest clothes quickly with this non-electric portable washer. Using very little water and in just a few minutes, you can wash up to five pounds of clothes. It is small and lightweight, so you can place it on a counter or table, or bring it along on long trips and vacations. Additionally, with its low price tag, you won’t be draining your savings to wash your clothes. Removes tough stains. Mud, food and grime are no match for this powerful device. By adding just a small amount of detergent and water, this machine can remove all types of stains. For bigger, more difficult stains, a little pretreatment may be necessary, just like with most washing machines. Lightweight, yet sturdy. The Laundry Alternative weighs only 5 pounds, making it easy for you to move around your home or set on a table. It is 16-inches long and 12-inches tall, small enough to fit in a car for or store in a closet. Eco-friendly features. Laundry Alternative uses very little water and you don’t have to use much detergent to clean your clothes. Additionally, this machine requires very few parts and tools to set up the machine and begin washing clothes. Saves you time. It doesn’t take long to wash one batch of clothes. In less than 10 minutes, you can load the machine, crank it and have clothes drying on the laundry line. Clothes come out wet. There is no drying feature on this machine so your clothes come out sloshy and filled with excess water. You will need to wring clothes out well before hanging them up to dry. Requires a lot of manual effort. You can’t just set this washing machine and let it run. You must crank the washer to get the clothes and water flowing. An entire batch of laundry requires much physical work. Buyers who don’t want to spend all day doing laundry should consider a portable washing machine. These machines come is a variety of sizes and designs — such as a twin tub design — and help clothes dry faster so your laundry takes less time to complete. The best portable washing machines and dryers should still offer a compact design and a user-friendly display panel so you can adjust the washer and dryer settings without any difficulty. This portable washer and dryer boasts an extensive feature set that you won’t find on many lower-priced models. Not only does this Magic Chef washer feature a sturdy design, a large 2.1-cubic foot washing tub and six cycle options, it provides an air-dry option so you can avoid hanging clothes out to dry. Plus, its LED display and electronic controls help all users utilize the machine with ease. However, you will be paying much more for this portable washer and its price tag is much closer to a full-size washing machine. Powerful air dry setting. You won’t spend hours hanging your clothes to dry. The air dry setting helps clothes dry quickly without the need to remove the clothes, wring them out and hang them on a laundry line. Ideal for larger families. With its 2.1-cubic foot stainless-steel tub, you can wash large batches of laundry at once. This larger capacity is ideal for families of 2 or more individuals. Plenty of design extras. This Magic Chef machine is built with many small design features that make your life easier. There is a detergent dispenser on this machine, along with built-in cabinet handles which help you move this large machine. Additionally, the lid on this portable washer folds and features a viewing window. When folded, you can still insert clothes into the device. This is particularly beneficial if you have a tight space and less room to raise the lid. Delay-start function. The delay-start function lets you choose when a load of laundry begins. This means you can wash clothes according to your schedule — whether you are at home or away. Time-remaining Indicator. You won’t find yourself twirling your fingers and waiting for your laundry cycle to finish. The time-remaining indicator on this machine tells you exactly how much time is left in the cycle. This is a feature that is rare to portable washers. Large price tag. You will be paying hundreds of dollars more for this device than other portable washers on the market. It offers a large feature set but you need to make sure you’ll utilize all its features to justify the high cost of the product. Difficult to move. This washing machine is no lightweight. Weighing 79 pounds and measuring up to 37-inches tall, this machine is large and bulky. You need to ensure you have plenty of room to store and use this washing machine in your home. The Best Choice Products Mini Twin Tub is a perfect option for homes with one to two individuals. It is lightweight — weighing only 23 pounds — and easy to move, which makes it ideal for storing and using in apartments. Its washer and spin dry times are short and its price tag is even better. Its twin tub design does require more effort from you when completing a load of laundry, but it provides plenty of power to clean your clothes and remove a variety of stubborn stains. Ideal for smaller family. The washing machine can hold up to 8 pounds of laundry, ideal for just one to two individuals. It is made from durable plastic, so you don’t have to worry about rust and other materials damaging it. Short cycle lengths. You won’t spend all day doing laundry with this machine. Washing a load of laundry takes approximately 15 minutes while the spin dryer takes less than five minutes to remove the extra water. You can have a full load of laundry complete within 20 minutes. Easy to move and store. Weighing only 23 pounds, this portable washing machine is light enough that most individuals can move it with ease. It is also only 23-inches long, 13.5-inches wide and 26-inches tall, making it easy to store in small and cramped areas. Excellent value. This portable washing machine boasts an extensive feature set, a twin tub design and sturdy construction, all at a low price tag. Tends to become unbalanced. This machine is powerful, but its power often knocks this machine off balance. When using this machine, place it on a sturdy foundation and do no overload it.